The Funky Felter: EtsyFAST's Showcase on Friday! This Friday, my fellow members of Etsy's Fiber Arts Street Team and myself will be featuring our lovely fiber creations and supplies in Etsy's home page main showcase. There will be a variety of handmade items to see and wonderful Etsy shops to discover so be sure to visit the showcase on Friday, September 7th! Hi Shalana! I just wanted to stop by and thank you for joining the Indiepublic Blog Ring! Welcome! Hi Shalana! 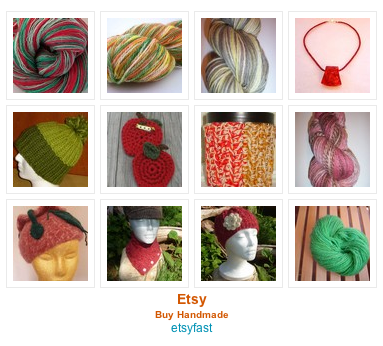 Look at all that apple-y goodness... Love the etsyFAST team challenges, what a great idea. Must get the scarf I'm thinking of for the challenge posted.